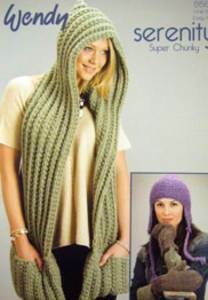 Scarf with hood: 600g. Mittens and hat each 100g. Based on 100g balls 70% acrylic with wool and alpaca. Suggested yarn Twilleys Freedom wool (may require extra). 10st/ 14 rows to 10cm, 10mm needles. Scarf and mittens 9mm and 10mm needles, hat 8mm needles.